Free, printable Trivia Questions are great to use as one of your fun party game ideas! There are trivia questions for just about every party theme imaginable. Choose one that fits your party theme, and print it out. Then take it yourself and print out your answers so you know which are correct. You can also find lots of fun games you can print out for a fee. 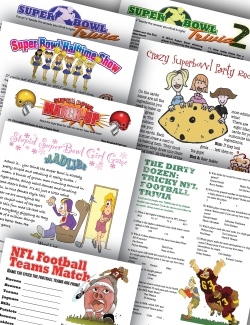 These printable games look great and are a lot of fun to play with your party guests. Check them out now!You can find over 50 printable Halloween games for only 19.95. .
Let the kids have some fun with the trivia questions and make sure you have a small prize for the winner...or winners! You can use some printable coloring pages as a prize!There are also lots of printable trivia questions you can buy, so choose the games that are best for you. Back to the future trivia~~~Remember Marty and The Professor? Olympics trivia~~~How well do you know your Olympic facts? Pro football trivia~~~Got Pro smarts? You can buy many of these printable trivia questions. They are the perfect games for your parties and as you can see, we have many themes. There are also some free games mixed in with the ones you can buy. You can also make up your own party trivia, it is pretty easy if you know anything about the subject of your game. Some people just don't have the time to sit and prepare a challenging, fun party game and that's who the games you have to buy are for. Having a party takes a lot of planning and preparations and that can be quite time consuming. So take your games or buy them...have fun with them. For more Kid Party Ideas go to Birthday Party Ideas for Kids!